As I’ve stated earlier the purpose of my blog is to bear my witness that the Book of Mormon is another witness of Jesus Christ. This blog post is the first of several about the writers and the construction of the Book of Mormon. To understand the Book of Mormon it is important to understand its organization, and the times and the context in which it was written. Into this context we can fit the major writers of the Book of Mormon. We can come to know each writer and hear their specific testimony. They all testified of Christ, but each writer has their individual style and their particular emphasis. Joseph Smith was not the author of the Book of Mormon. He was simply the translator. Multiple writers contributed to the Book of Mormon. Joseph Smith’s own writings have a very different style than the wording of the Book of Mormon. The title page of the Book of Mormon states the following: “An account written by the hand of Mormon upon the plates taken from the plates of Nephi.” Mormon lived around 315 to 385 AD. He had access to the many records written by various other prophets from the time that Lehi and his family left Jerusalem around 600 BC. The records had been engraved on metal plates. He had the onerous task of abridging these records into a manageable size. During this abridgment process he quoted verbatim several other writers. My focus is to be true the purpose of the Book of Mormon to bear witness that the Book of Mormon is another witness of Jesus Christ. The history and geography help put the Book of Mormon in the time and context of the Bible, both the Old and New Testament. The small plates of Nephi are an unabridged record of the writings of Nephi, his brother, Jacob and a few other writers, covering the time period from around 600 BC to 130 BC. Even though this is a large time period, the bulk of it only covers 181 years. 288 years are quickly summarized in only five pages. The second record is an abridgement of the large plates of Nephi by Mormon, covering the time period from 130 BC to 386 AD. The bulk of this record is the 130 years before the coming of Christ, giving us a pattern to prepare for the second coming of Christ. The book of Ether is a record of the Jaredites, another group who migrated from the Old World at the time of the Tower of Babel. It is taken from some plates which Nephites found. 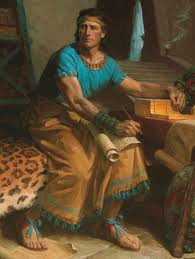 The personal writings of Mormon and his son, Moroni make up the last section of the Book of Mormon. In the next few posts I’ll go into more detail about the different sections of the Book of Mormon. Each is unique. Skillfully interwoven throughout the pages of the Book of Mormon is a witness of Jesus Christ. We are taught by the pure testimony of prophets. Principles are illustrated through the stories. Examples are given of righteous living and wickedness. We are taught the consequences of sin and are asked to “consider on the blessed and happy state of those that keep the commandments of God. For behold, they are blessed in all things, both temporal and spiritual; and if they hold out faithful to the end they are received into heaven, that thereby they may dwell with God in a state of never-ending happiness. O remember, remember that these things are true; for the Lord God hath spoken it.” (Mosiah 2:41) To me it is record of heaven itself. This entry was posted in Book of Mormon construction and tagged Bible, Book of Mormon, Christ, Christianity, Church of Jesus Christ of Latter day Saints, James E. Faust, Jesus Christ, Joseph Smith, Keystone of our religion, Mormon church, Mormons, scriptures, truth, witness of Christ. Bookmark the permalink.